Siddharth Rana, the Joint Director of the IB, is at his wits end attempting to unravel that mystery. Working with the blindest of clues, Siddharth has to race against time to prevent terrorists from achieving their horrific goal-an India laid low by a catastrophe of biblical proportions. This is a story that leaps across continents, gets to the heart of convoluted terrorist plots and attacks and amazes you with its exposition of high-tech gadgetry and science. It is equally a story of breathtaking bravery, recounted at a mind-blowing pace. At its core, it is also a story about the beauty of relationships. Relationships that are beyond national boundaries and historic enmities. 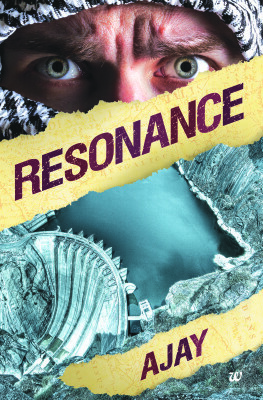 Review- "Resonance" is the excellent debut by author Ajay. Book show's the vast knowledge of author about international agencies, how they work, borders or india and pakistan. You're hooked to book from the very first page and you're hooked untill the last page. Every chapter is ended with the question what next? You're forced by the strength of the plot and story to turn the page. About the cover and title of book, it is perfect for the plot as the plot revolves around the scientific term Resonance which is used by a terrorist group to destroy a dam. Language is simple and easily understandable, only thing which i missed is dialogues and effective writing skill. You keep missing the effective writing which is covered by excellent plot and storyline. There's a love angel too between Aryan and Juhi who study together in US. The thriller is peppered with high end gadgets which a story a filmy feel. So Resonance is the Must Read book for thrill and patriotic friction lovers with lot of knowledge. You can get your copy from Amazon or Flipkart or nearby book store.